LG Electronics, in collaboration with Mobilink launched the state-of-the-art Google Nexus phone in Pakistan. The phone will be financed and distributed in market and to Mobilink by Brightex Distribution. Mobilink will also offer a bundle package to its customers along with the phone which will include 2GB bucket for 90 days & Free Trial offer of Mobi-Music for 15 days. The Nexus 4 is the newest smart phone in the Nexus line-up from Google. With a sophisticated hardware design from LG, incredible processor powered by Qualcomm Technologies Inc (QTI), Qualcomm® Snapdragon (TM) S4 Pro Processor, and using a 1.5 GHz quad-core CPUs, the Nexus 4 puts the best of these leaders in the palm of your hand. “Farid Ahmed, Vice President, Marketing Mobilink, highlighted “Mobilink is leading the innovation on mobile data in Pakistan. The Google Nexus 4 with our aggressive data bundle offer is a reflection of our commitment to innovation and offering the best to our customers. We hope that our customers will enjoy this great product while browsing the web with unlimited mobile freedom. Also speaking on the launch occasion, Mr. Naeem Tabish, CEO Brightex Distribution expressed his gratitude to partner with LG Electronics and Mobilink Pakistan. “We hope that through our efficient and effective distribution network, we provide the best and unmatched combination of technology and services to the end users.” He further added. Nexus 4 comes with a high-performance 8MP camera and takes stunning 360° Photo Sphere images, letting you capture every detail of the world around you. Up, down and all around you, it’s like no camera you’ve ever seen; with Nexus 4, you can snap pictures in every direction that come together into incredible, immersive Photo Spheres that put you right inside the scene. Plus, photos upload themselves with Instant Upload so you’ll never lose a shot. All of this comes to life with stunning clarity and crisp, natural color on the vibrant 1280-by-768 4.7-inch True HD IPS Plus display supported by Zerogap Touch technology. Gently curved glass edges allow your finger to slide smoothly on and off the 320ppi screen, while cutting edge display technology means you feel like you’re touching every pixel, protected by scratch resistant Corning® Gorilla® Glass 2. Built for speed: Nexus 4 comes with a cutting-edge Qualcomm Snapdragon™ S4 Pro processor, so you’ve got speed and power to spare. Zip around the web, experience rich 3D graphics and gameplay, and effortlessly switch between multiple apps without ever missing a beat. With 2GB of RAM and the fastest version of Android ever, Nexus 4 is the snappiest Nexus smartphone yet. Information at your fingertips: Nexus 4 comes with the latest Google apps, putting the best of Google in the palm of your hand. The latest version of Google Now is built-in, which keeps you even more organized – get reminders about upcoming flights, restaurant reservations, hotel confirmations and even nearby photo opportunities – when and where you need them. Get to the places you care about quickly and easily with Google Maps™ from Android. With turn-by-turn GPS navigation, live traffic info, and integrated driving, walking and public transit directions, getting from A to B has never been easier. 3D Maps and rich satellite imagery give you a more realistic sense of what’s around you while features like Street View and Indoor Maps make sure you always know what’s in front of you. 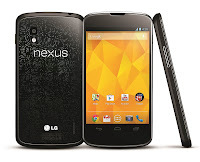 Nexus 4 is sold unlocked and will be available to purchase in 16GB version.